Today we did a good walk up the fells around Blencathra, starting with Souther Fell and ending on Bowscale Fell. The weather was superb with the sun shining, and a breeze to keep us cool. Little and Great Mell Fell from the start of the ascent up to Souther Fell. The edge of lakeland and the Pennines in the distance. Blencathra from the summit of Souther Fell. The true summit of Souther Fell, with Blencathra and Bannerdale Crags behind. The ridge leading up to Bannerdale Crags to the right looks like a good climb, one for the future maybe? Blencathra and Sharp Edge over Bannerdale Crags. Bowscale Fell and The Tongue. 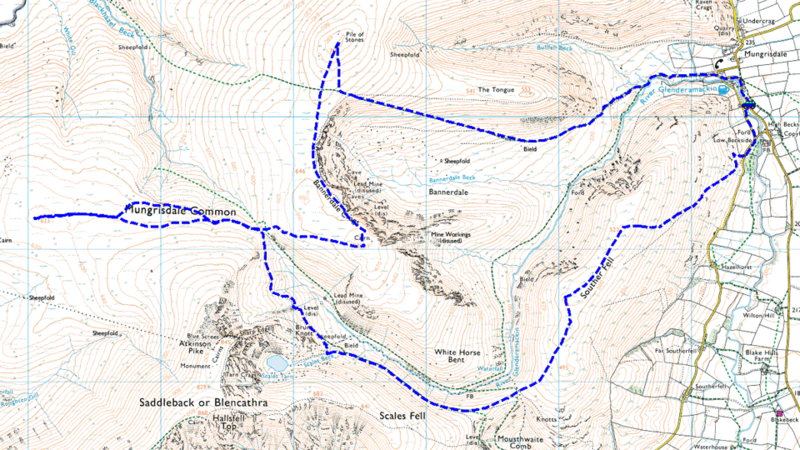 The diagonal path to the left will be out route of descent back to Mungrisdale. Blencathra and Bannerdale Crags from the second summit of Souther Fell. It was just stunning up here today, bit windy, but with views like this you can complain. Sharp Edge and the slopes of Bannerdale Crags from the top of Mousthwaite Comb. The legendary Sharp Edge. You can just make out some people in the centre. Mungrisdale Common summit cairn - looking towards central lakeland. And again, this time towards Great Calva. High Pike from Mungrisdale Common. And Carrock Fell from the same location. Last photo from the summit of Mungrisdale Common. Although not exactly the most exciting summit, we were out of the wind up here so it was lovely and warm. Bannerdale Crags summit with an uninterrupted view right across to the Pennines. Sharp Edge from Bannerdale Crags. Bannerdale, far below the crags. Great Calva from Bowscale Fell. Out route of decent was the straight path alongside The Tongue which took us straight back to Mungrisdale.